A short French Polishing course will give you the skills to create a beautiful finish on any wooden surface. Many French Polishers are also skilled woodworkers, as these activities often go together; - whether your interest is in developing a hobby or a full-time career, understanding how wooden objects are put together gives the confidence to tackle any restoration or conservation project. If you are interested in both woodworking and French polishing, the course can be extended to include both; one-to-one tuition on a course designed specifically for you. Complete beginners may want to focus first on basic skills like maintaining and using tools, and this can be done while restoring a piece of furniture. Or you may like to learn in the process of making your own new object like a small inlaid or veneered box or a chessboard. So our Woodworking Course can include a wide range of skills. You can select the areas you want to focus on (depending on how many days you choose to attend). Sharpening Hand Tools - Learn how to create a razor-sharp edge on your chisels, planes and cabinet scrapers. Use of tools - Learn how to use the full range of woodworking tools. Common Wood Joints - Learn to make perfect dove tail joints, secret dove tail joints, mortice and tenons joints, rubbed joints, spliced joints etc. Restoration Projects - Bring a damaged jewelery box, tea caddy, table, chair etc , and learn how to restore it right through to the final French polishing. New Projects - A project of your choice, which can be a good way to cover many skills, for example, a small box will teach you box construction and joints, clamping, inlays and veneers etc.
" I particularly appreciated how Roy worked with me through many restoration challenges regarding veneer cutting & matching, and grain filling complex burr veneers, even before we put our first coat of shellac on. We spent hours on these restoration challenges. The ability to adapt the course to tackle restoration and french polishing challenges together, end to end, was fantastic. Many times during the course I experienced the ‘light bulb’ moment wishing I had thought of these solutions and ideas years ago. In my opinion this course is suitable for total beginners and those with some experience who want to expand their knowledge and reach another level of results. Being able to tailor this to include restoration work really makes this a good self investment for the polisher or budding woody. Do spend time noting the tools and materials that Roy uses. He only uses the glues, pigments, polishes and ‘gadgets’ that have proved their worth and stood the test of time. Learning from these will stop you making many mistakes, as I have in the past. The course comes with a good selection of aid memoir notes and guidance on the principles you have covered, and on the suppliers who have stood Roy with good service. If you require a deeper explanation of any aspect of this art, Roy also has an immense depth of technical knowledge that he can draw on, but if you just want to learn to french polish and get on with it then this is also the course for you….. but I think Roy always welcomes a challenge. In relation to accommodation, Lincoln with its Cathedral is only 10 mins away and there are a range of good hotels, pubs and lovely restaurants around the Cathedral district to pass the evening away. 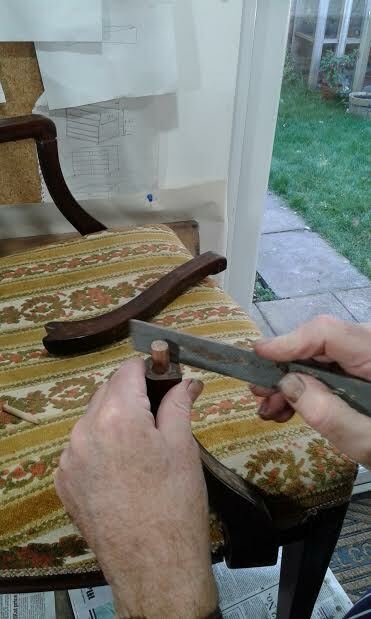 “I have completed my second Furniture Restoration course with Roy, having first been on his French Polishing course. I arrived with several pieces of antique furniture, each with their own challenge. We discussed my expectations for each piece and methods to achieve the desired result. Having been on earlier courses, I was able to work with Roy on each item and learn what I had to do. I then found that with my earlier experience, I was able to say, that’s fine, I can finish them off at home. This gave us the time to work on the next item. "Just a quick thank you for the 3 day polishing and restoration course, I thoroughly enjoyed myself. I thought your teaching method was excellent and your knowledge vast, I can't wait to put what I have learnt into practice. I've purchased a couple of pieces of furniture already both just crying out to be restored and polished. I will stay in-touch and send over some pics, Barlis have also been in contact re my order thank you. It was also great chatting to Jenny and please thank her for the fantastic lunches.